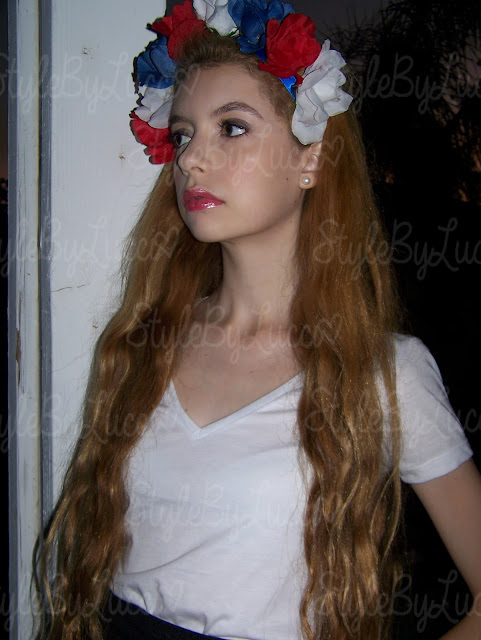 StyleByLucci: ☆ NEW VIDEO ☆ 4th of July Fashion! Hi guys! I'm really excited to start this blog, as well as my YouTube channel! I just posted a new video on my Summer 2013 Outfit of the Day for this 4th of July. Hope you'll like it! Please subscribe to my channel, as well as comment, and 'thumbs up' the video! I would really appreciate your help, making videos is what I love to do! I'd love to continue to share my style and my life with you and pursue my passions at the same time! I'm wearing a floral crown that I made out of red, white and blue roses, classic pearl earrings, a plain white tee from Forever 21, a denim-looking high-waisted circle skirt from Marshalls, and red platform wedges by Nicole Miller.